All cities can transform their urban form to accommodate new configurations of programs, connectivity and activities. For some cities, this process will take longer, while others can do it more quickly. When living in the UK I became interested in the density comparison between UK and US cities, and the question: What is it like to live in the driest desert city in North America, Las Vegas? How could this unsustainable condition be made resource-efficient and liveable? I found comparing UK cities with US cities helps to better understand the urban qualities of cities in the United States. The sprawling, urbanistically controversial city of Las Vegas is an interesting case to study (Venturi, Scott Brown and Izenour, 1969/1972; Garreau, 1992; Sorkin, 1992; Hess, 1993; Gandelsonas, 1999; Inam, 2016; de Salvatierra and Solana, 2018). It is a geographically isolated city and one of the fastest growing metropolitan areas in the US, with over 2 million residents. According to UNLV population forecasts, there will be an additional 835,000 people by 2035. Unlike most other cities, Las Vegas has not been developed on the banks of a river or estuary but in the unforgivable climate of the Mojave Desert, where water scarcity and solar gain are key issues (the whole city could easily be run on solar power). With weekend tourists swelling the city’s population to 3 million, all of these people require water, energy, food and transport. Las Vegas gets, on average, less than five inches of rainfall a year – it is the driest city in the US – where everything competes for what little water exists. Instead of accepting the reality of “limits to growth” (Meadows et al/Club of Rome, 1972), Las Vegas is not known for resourcefulness. The city has a fragility and precariousness but remains to a large degree in a state of denial about its environmental vulnerability. Scientists warn that in 50 years, due to global warming and soaring summer temperatures, Las Vegas and the American Southwest might become largely uninhabitable (Rich, 2018). The American city is different: it is largely built by private investment (the Strip is a good example of this) and, as a consequence, public policy is heavily shaped by private profit motives and initiatives – one of the reasons why the benefits of urban projects are unevenly distributed, and economic gain has priority over social benefits (Inam, 2015). Affordable housing, environmental measures and infrastructure for public transport is not always funded. Most of the city, apart from the Strip, is not pedestrian-friendly, and the windowless casinos along the Strip are designed with the aim of keeping people inside. Compared to the UK or Europe, the United States is always much harsher in its economic realities. Throughout the 20th century, the availability of cheap gasoline fuelled suburban construction, but when petrol became more expensive the suburb was no longer a good idea. Nevertheless, everybody still drives in Las Vegas. The residential neighbourhoods are mono-functional (not mixed-use), car-dependent (not walkable) and sprawling (not compact enough). Urban infill is a new concept in Las Vegas. While it is obvious to most planners that the future of Las Vegas will depend on the acceptance of a very strict and tight growth boundary and smart densification methods to slowly increase population density, the necessary change in mind-set has not yet happened. However, a growth boundary for all development is increasingly recognized as the only way to reduce the current car-dependency and to enable feasible public transport in the form of a bus rapid transit system or a light railway. There is also increasing interest in cycling and a Downtown Bike Lane Master Plan for 250 miles of bike lanes has been developed in 2016. The most current regional planning vision document of Las Vegas, developed by Southern Nevada Strong, is online here: http://sns.rtcsnv.com/. It is a vision document developed under the leadership of the Regional Transportation Commission (RTC) of Southern Nevada. The RTC is a regional entity that oversees public transportation, traffic management, roadway design and transportation planning efforts known as Southern Nevada Strong. Hence, the vision has a strong view on transport issues and is weak on all the other aspects of a sustainable city. It is probably time to raise the question of whether the RTC is the best agency to drive a sustainable city vision. Las Vegas is such an interesting place to study because it is an intense hub of human activity, entrepreneurial spirit, and a product of the automobile era that is on the cusp of fundamental change. It has a strong economic base in the area of hospitality, tourism, retail, health care and sports events. Numerous good initiatives are on the way to make the city more sustainable: despite its reputation for being wasteful, Las Vegas reuses 93% of its water (data 2017). This has become a necessity, as water resources keep shrinking. Lake Mead was created by the Hoover Dam in 1935 and provides water for over 20 million people in the region. 90% of the water in Las Vegas comes from Lake Mead. Since 2000 the water level of Lake Mead has shrunk. A whole-hearted move towards water recycling was a matter of survival and gives us hope that further initiatives will follow. 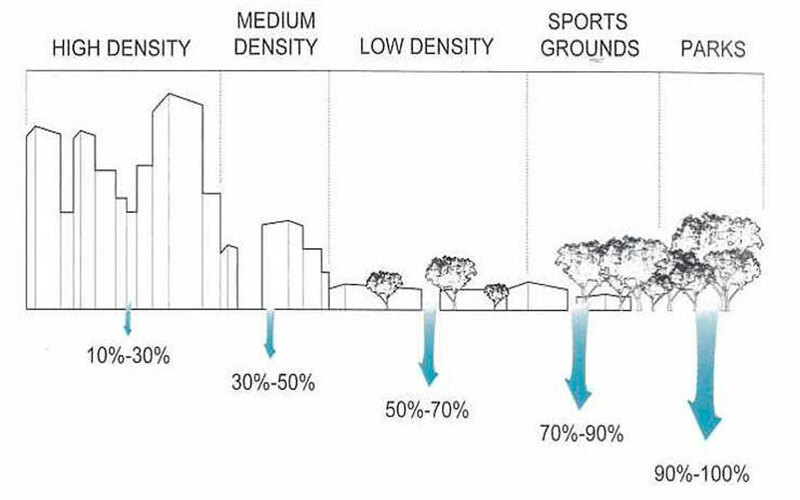 As cities get denser, the issues of water management and urban heat become significant (see: Fig. 1). 50 years after Learning from Las Vegas (Venturi, Scott Brown and Izenour, 1969/1972), the new urban vision includes taking more advantage of the solar energy available all year round (beside some small initiatives, solar power is so far a widely untapped resource), pursuing a powerful vision of restricting fossil energy use in favour of an increase in renewable energy supply, helping to envisage a future powered by 100% solar energy (Scheer, 2006; Droege, 2008). Upscaling the use of solar power will be the logical next step. Studies are also on the way to examine the whole life cycle of the city, its buildings and neighbourhoods, and rethink its urban systems, to ensure economic growth does not damage the sensitive desert ecosystem. Atwood, C. and Schwarz, DM. (2010). Learning in Las Vegas; Yale School of Architecture publication, New Haven. Bay, JHP., and Lehmann, S. (eds.) (2017). Growing Compact: Urban Form, Density and Sustainability. London: Routledge. De Salvatierra, A. and Solano, S. (2018). ‘On the Liminal Fertility between the Sacred and Profane in the Sin City of Neon Lights’, ACSA/COAM 2018 proceedings, Madrid (presented paper); UNLV, Las Vegas. Droege, P. (2008) Urban Energy Transition: From Fossil Fuels to Renewable Power, Elsevier Books. Gandelsonas, M. (1999). X-Urbanism: Architecture and the American City, Princeton Architectural Press, New York. Garreau, Joel (1992) Edge City: Life on the New Frontier, Penguin Random House, New York. Hess, A. (1993). Viva Las Vegas: After-hours Architecture, Chronicle Books, San Francisco. Inam, A. (2016). “Unveiling Vegas: Urbanism at the Nexus of Private Profit and Public Policy”, in Journal of Urbanism: International Research on Place-making and Urban Sustainability, Vol. 9, Issue 3, pp. 216-236. Lehmann, S. (2010). The Principles of Green Urbanism. London: Routledge. Lehmann, S. (2017). “The Challenge of Transforming a Low-Density City into a Compact City. The Case of the City of Perth, Australia”, in: Growing Compact: Urban Form, Density and Sustainability, Bay, HWP. and Lehmann, S. (eds), Routledge, London/New York, p 69-93. Meadows, DH., Meadows, DL., Randers, J. and Behrens, W. (1972). The Limits to Growth: A Report to the Club of Rome's Project on the Predicament of Mankind, Universe Books, New York, NY/Pontomac Books, Washington DC (1971 Report/1972 Book). Rich, N. (2018). “Losing Earth: The Decade We Almost Stopped Climate Change”, New York Times, 1 Aug. 2018, New York; available online: https://www.nytimes.com/interactive/2018/08/01/magazine/climate-change-losing-earth.html, accessed 10 Aug. 2018. Scheer, H. (2006). Energy Autonomy, Routledge, London. Sennett, R. (1974). The Fall of Public Man, Faber, New York. Sorkin, M. (Ed.) (1992). Variations on a Theme Park: The New American City and the End of Public Space, Hill & Wang, New York. The Urban Task Force and Rogers, R. (1999). Towards an Urban Renaissance, (Report, June 1999), UTF: DETR and E & FN Spon, London (available online). Venturi, R., Scott Brown, D., and Izenour, S. (1969/1972). Learning from Las Vegas. Cambridge MA, MIT Press.